Recently while doing my laundry, I noticed a cone shaped receptacle at the top of the central shaft of my washing machine. My roommate told me it was for fabric softener, and that the cone holds the liquid in place until the spin cycle, at which point the fast rotation of the shaft causes it to migrate out to the edge of the cone, where it can then drip over the edge into the bottom of the washer. I wondered, given a particular cone steepness, how fast would the shaft need to spin to overcome the force of gravity holding the fabric softener in place? 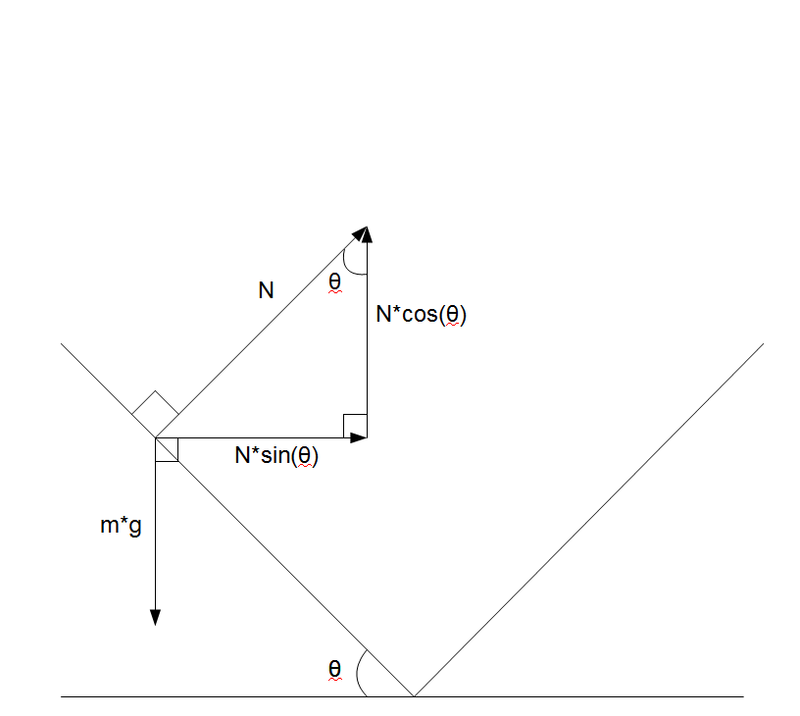 As you can see in the force diagram, we assume the cone is symmetrical with a radius “r” and angle of steepness “θ”. Ignoring friction and viscosity effects, there are two forces acting on the drop of fabric softener: a normal force “N” and gravity, which is simply the mass of the liquid “m” multiplied by the gravitational constant . Surprisingly, the mass of the liquid has no effect on the threshold speed. Considering the cone in my laundry machine has a radius of about 2cm and an angle of steepness around 45° (=π/4), the threshold velocity would be about 0.443 m/s. Dividing this by the circumference of the cone (0.126 m) gives an angular velocity of about 3.5 rotations per second. In other words, the washing machine must rotate at least 3.5 times per second to “push” the fabric softener over the edge of the cone. Seems pretty fast! No wonder washing machines consume so much electricity.